Alan N. Gendler, who helped Rep. Jack Kemp get Jews out of the Soviet Union during the 1970s, then went on to a career assisting veterans as a social worker, died Saturday in his Amherst home after a short illness. He was 87. Mr. Gendler was born in Omaha, Neb., and grew up in Ottumwa, Iowa, southeast of Des Moines, the home of the fictional character Radar O’Reilly, of the “M*A*S*H” television series. He attended the University of Iowa for his undergraduate studies and played clarinet in the marching band — missing by one year the football team’s appearance in the Rose Bowl in California. Afterward, he joined the Army, serving from 1953 to 1955 as a medical social worker at a field hospital in Germany. Returning from service, he attended Western Reserve University in Cleveland for his master’s degree in social work. There he met Charlotte Engel, an undergraduate, in 1957, and they married later that year. The couple moved to Buffalo in 1963 so Mr. Gendler could work for the Community Welfare Council, which at the time was a planning arm of the United Way. In the early 1970s, he was hired by the Jewish Federation in Buffalo to staff a special committee leading a regional initiative of a worldwide effort to get Jewish “refuseniks” out of the Soviet Union. Refuseniks were people, typically Jews, who were denied permission to emigrate from the Communist nation. Jewish organizations and communities around the world worked for decades to get them out of Russia and other Soviet republics, and particularly into Israel. Mr. Gendler was among representatives of various Jewish federations who brought signed petitions to Washington, D.C., pressing for government help, and found in Kemp a strong advocate. Following his retirement, Mr. Gendler became a residential real estate agent and expanded his volunteer efforts in the community. He was active in the Meals on Wheels program and at Temple Beth Tzedek and its predecessor, Temple Shaarey Zedek, where he worked in the men’s department at its annual rummage sale. He also was active in the Jewish Federation Cemetery Corp., which manages several of the Jewish community’s older cemeteries. His family noted that he was focused on making people welcome and embraced, and often invited people who were visiting to stay at his home. Proud of his Iowa roots, he and his wife named their fundraising team “Iowa Hawkeyes” for the annual Alzheimer’s Association Walk. 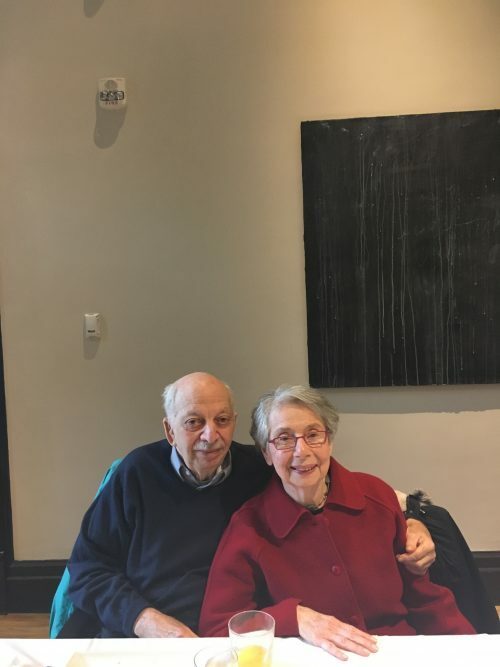 In addition to his wife, with whom he is pictured, survivors include a son, Howard; two daughters, Gail Gendler and Judith Epstein; and five grandchildren. Funeral services will be held at 2 p.m. Monday, April 15, in Temple Beth Tzedek, 1641 N. Forest Road, Amherst.